Discolored teeth occur for a variety of reasons. Discoloration could be associated with abnormal tooth formation and development (see amelogenesis imperfecta) or a traumatic injury. needed to establish a diagnosis. Discolored teeth are not normal and should never be ignored! Discolored teeth can become a serious health risk. Studies have shown that 90% of discolored teeth are non-vital (dead) or dying. The problem with dead teeth is that they are a source for the spreading of bacterial infection throughout the body. The consequences of this infection can be devastating from our professional experience. The cause of tooth discoloration must be investigated. 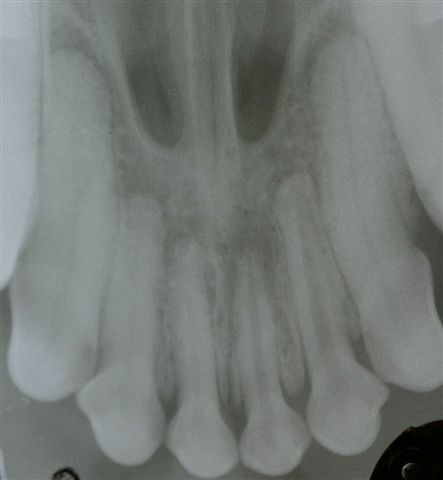 Dental radiographs are essential to determine the cause of tooth discoloration. 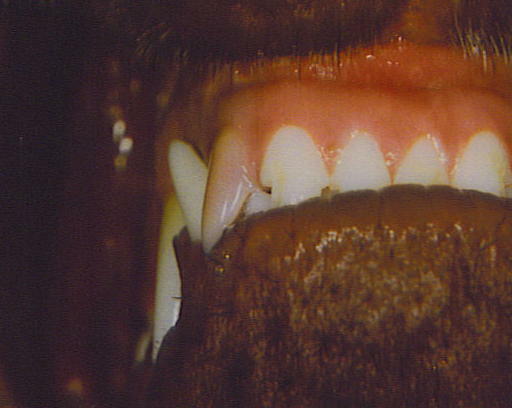 Without dental radiographs, the veterinarian can only guess the cause of tooth discoloration. Dental radiographs not only provide the diagnosis for discoloration, but also help in the treatment of the condition. Why are discolored teeth so common? Dogs are dogs and they are extremely persistent. Chewing hard objects often results in tooth injury. 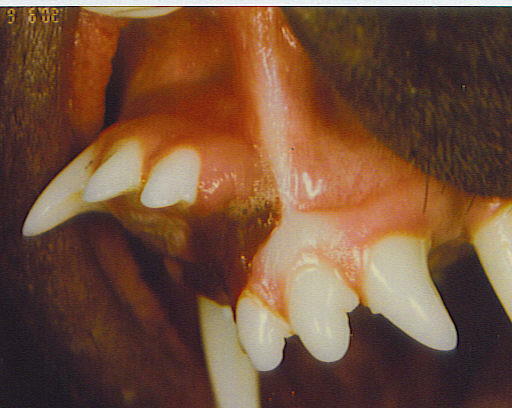 Dogs also play hard, sometimes at the expense of their teeth and jaws. 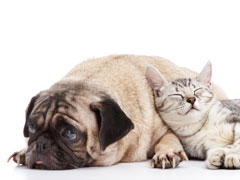 Cats with discolored teeth more likely have had facial trauma, or have an oral tumor. Initially the pulp becomes inflammed or bleeds. The result is a pink color of the tooth. This is often called pulpitis. Occasionally the pulpitis will resolve and the tooth returns to normal color. This however, is very uncommon. More frequently the tooth color changes to purple, tan, brown, black or any intermediate coloration. In cases with frank internal bleeding, the blood enters the dentinal tubules. This blood trapped within the dentin causes the color change. It is also a source of bacterial infection. Ignoring discolored teeth can lead to very serious health consequences as bacteria travel throughout the entire body via the blood stream. Attrition or abrasion may result in enamel-dentin fractures. Exposed dentin may lead to pulpitis and a non-vital tooth, however, dentin is a living tissue. Dentin has a blood and nerve supply, as well as, the ability to heal. Dentin heals by the formation of tertiary or "reparative" dentin which typically appears tan. Dental radiographs and evaluation with a periodontal probe, help further the diagnosis and treatment planning of these discolored teeth. Optimal treatment for discolored teeth can only be determined after the cause has been determined. Traumatic injury to teeth is the number one cause of tooth discoloration in our experience. If radiographs demonstrate a dead tooth, that tooth can be saved by root canal therapy, or it can be extracted. It is never appropriate to watch and wait for swelling to develop or draining tracts to appear. Waiting for these severe consequences to develop is illogical and unfortunate for the pet. 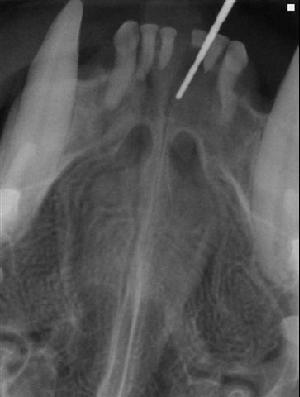 If radiographs demonstrate no internal problems or pathology around the root, the treatment strategy may be to seal dentinal tubules, restore and monitor the tooth. Alternately, root canal therapy or extraction may be appropriate treatment options. of bone density around the teeth. This dog liked chasing cars. He caught the bumper of a moving car. See above photo of the discolored right upper canine tooth. Tooth discoloration from exposed dentin.